Other books on information security metrics discuss number theory and statistics in academic terms. Light on mathematics and heavy on utility, PRAGMATIC Security Metrics: Applying Metametrics to Information Security breaks the mold. 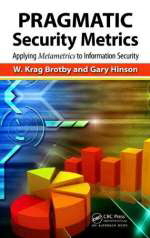 PRLog (Press Release) - Jan. 29, 2013 - Other books on information security metrics discuss number theory and statistics in academic terms. Light on mathematics and heavy on utility, PRAGMATIC Security Metrics: Applying Metametrics to Information Security breaks the mold. This is the ultimate how-to-do-it guide for security metrics. In addition to its obvious utility in the information security realm, the PRAGMATIC approach, introduced for the first time in this book, has broader application across diverse fields of management including finance, human resources, engineering, and production - in fact any area that suffers a surplus of data but a deficit of useful information. Visit Security Metametrics.com Security Metametrics supports the global community of professionals adopting the innovative techniques laid out in PRAGMATIC Security Metrics. If you, too, are struggling to make much sense of security metrics, or searching for better metrics to manage and improve information security, Security Metametrics is the place. Krag Brotby has 30 years of experience in the area of enterprise computer security architecture, governance, risk, and metrics and holds Certified Information Security Manager (CISM) and Certified in the Governance of Enterprise Information Technology (CGEIT) qualifications. Krag is a CISM trainer and has developed a number of related courses in governance, metrics, governance-risk compliance (GRC), and risk and trained thousands on five continents during the past decade. Krag’s experience includes intensive involvement in current and emerging security architectures, IT and information security metrics, and governance. He holds a foundation patent for digital rights management and has published a variety of technical and IT security-related articles and books. Brotby has served as principal author and editor of the Certified Information Security Manager Review Manual (ISACA 2012) since 2005, and is the researcher and author of the widely circulated Information Security Governance: Guidance for Boards of Directors and Executive Management (ITGI 2006), and Information Security Governance: Guidance for Information Security Managers (ITGI 2008a) as well as a new approach to Information Security Management Metrics (Brotby 2009a) and Information Security Governance; A Practical Development and Implementation Approach (Brotby 2009b). Gary Hinson - despite his largely technical background, Dr. Gary Hinson, PhD, MBA, CISSP, has an abiding interest in human factors, the people side as opposed to the purely technical aspects of information security and governance. Gary’s professional career stretches back to the mid-1980s as both a practitioner and manager in the fields of IT system and network administration, information security, and IT auditing. He has worked for some well-known multinationals in the pharmaceuticals/life sciences, utilities, IT, engineering, defense, and financial services industries, mostly in the United Kingdom and Europe. He emigrated to New Zealand in 2005 and now lives on a “lifestyle block” surrounded by more sheep than people. In the course of his work, Gary has developed or picked up and used a variety of information security metrics. Admittedly, they didn’t all work out, but such is the nature of this developing field (Hinson 2006). In relation to programs to implement information security management systems, for example, Gary had some success using conventional project management metrics to guide the implementation activities and discuss progress with senior managers. However, management seemed curiously disinterested in measuring the business benefits achieved by their security investments despite Gary having laid out the basis for measurement in the original business cases. And so started his search for a better way.